Kiwis love their meat. 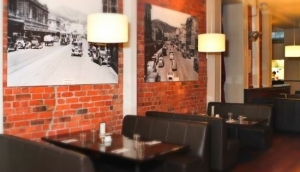 Steak Restaurants in Wellington seem to be on every corner, but quality can vary. Some of the best steaks can be found in pubs, or in hotel restaurants. But most good restaurants will have a steak option. Wellington Steak Restaurants are spread over quite a wide area. The CBD naturally has a sufficient selection, particularly around Willis Street and Courtenay Place. But if you're a desperate steak eater, you might want to head to Upper Hutt, where there are at least two very good grill rooms, whose steaks are famous. Porirua and Tawa also have a couple of good establishments, but if you're keen to stay local, you'll always find something along Cuba Street. The Waterfront has many swish restaurants, most of which serve steaks and grills, but you'll pay a premium for the location. If you're staying in a CBD hotel, check the restaurant menu - some of the best grills in town are often found right below where you're sleeping.